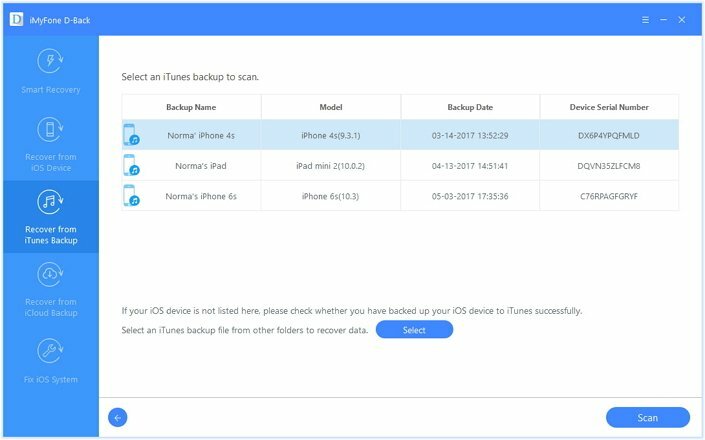 The most common tool we use to back up and recover data on iPhone/iPad/iPod Touch is iTunes, and this tool is strongly recommended by Apple so that users can use their coherent service. However, I believe lots of users would find iTunes’ disadvantages on backing up and recovering iPhone data. See them as below. 1, You will have to back up the whole iPhone/iPad/iPod Touch, including these data unnecessary. 2, The process of backing up is pretty time-consuming and you cannot read the data in iTunes backup. 3, You cannot selectively recover data in iTunes backup. The whole backup will be restored. 4, After restoring, the data in iTunes backup will replace the current data on your iOS device. Just like I used to be, many users are trapped in these weak points of iTunes but have no better iTunes alternative PC. But now here comes good news. There are some good third-party applications can take the place of iTunes to back up and recover iPhone data. 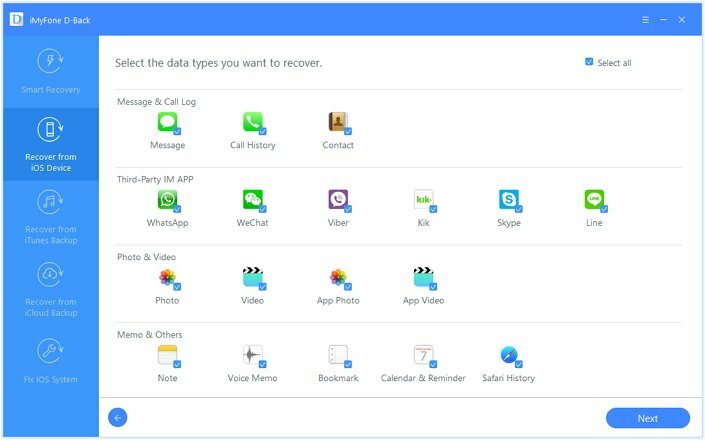 And among these applications, iMyfone D-Back iPhone data recovery tool for Windows and iMyfone D-Back iPhone data recovery tool for Mac are the best iTunes alternative which avoid these iTunes’ disadvantages and own other outstanding features. Selectively back up and recover iPhone data which you need. 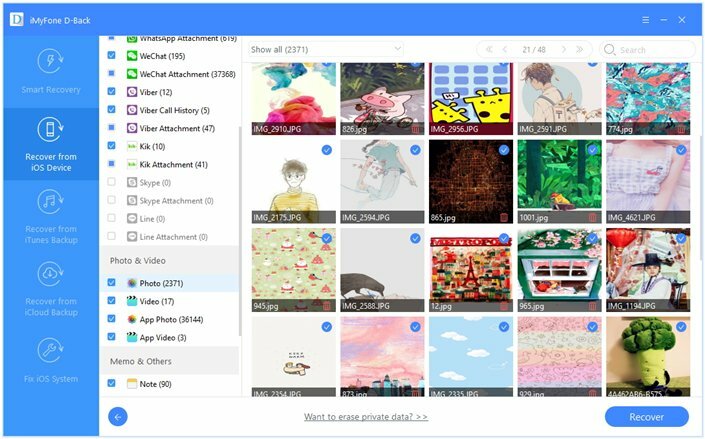 One click to back up and recover data makes the process easy. Preview the specific content before backing up and recovery. Recover data from iOS devices/iTunes backup/iCloud backup. Support backing up and recovery for iPhone/iPad/iPod Touch. Won’t overwrite & effect the current data on your iOS devices. And we will show how to back up your iPhone and recover data from your iTunes backup with the best alternative to iTunes. Install and open the program on your PC/Mac. Click on "Recover from iOS Device" and then select the green “Start” button. Choose the files types you need to back up from your iOS devices. Step 2. Scan and Preview Your iPhone Data. Then you will be prompted to connect your iPhone. After the program automatically identifies your iPhone, select the “Scan” option and you will be given all the content you selected in the beginning. Preview and check the ones you need. Step 3. Back Up Selected Data onto Your Computer. Click on “Recover” at the lower right part of the window and you will be prompted to select a destination on the Mac or PC to save the data you check and wait for a second the backing up will be finished. Step 1. Choose Files Types & iTunes backup to Scan. From Recover from iTunes Backup, click Start to select file types you want to recover. And then, iMyfone D-Back will list all the iTunes backups on computer. Choose the most relevant one and click Scan. After scanning, the data in iTunes backup will be displayed and you can browse through the content accordingly. Pick between Show all or Show only the deleted files and select the ones you need. Hit Recover and make a recovery folder and a path that links to the recovery. All the files recovered by iMyfone D-back will be stored to that folder. Check the folder after recovery. And of course, this iTunes alternative for PC/Mac can also extract/recover your data from other modes with similar process. And now, you may get the information about what is the best alternative to iTunes. What may surprise you is that iMyfone D-Back for Windows and iMyfone D-Back for Mac offer free trial version to users for confirming whether this tool is useful for them. what are you waiting for? Just download and have a try!